My thoughts on the latest single from CY8ER. When it comes to CY8ER I’m still in somewhat of two minds. On the one hand I’m starting to warm up to them, they do have some pretty decent songs but granted nothing that’s really blown me away so far. On the other, maybe I’m expecting too much from a group that kind of is just a collection of girls who are more well known for their achievements in other fields/projects. If that last sentence hasn’t made you close the tab in disgust, then perhaps you’d like to go back and read my reviews of “Remix Start” and “Te to Te“. They’ll give you a bit more of an idea of where I’m coming from here. Anyway, CY8ER have undergone a few changes since their last single “Te to Te”. The main one being the addition of 3 new members to the group. We have Yamiyume yAmmy (purple), a fashion model and designer, Naatan Coromushi (red) and Fujishiro Anna (green) who some of you may be familiar with from her stints in BELLRING Girls Heart and ICE CREAM SUICIDE. A pretty diverse selection of new recruits I’m sure you’ll all agree. You also have to wonder just how well connected Rinahamu is in the industry to seemingly be able to not only find these girls but talk them into joining her various projects. When it comes to this single, I’m mainly interested to hear what the 3 new members bring to the table in the vocal department. That is if I’m able to make them out and they’re not all polished and vocoded to hell and back in post production, as seems to be the case with CY8ER vocals. I don’t hate it, I’m just saying they could maybe turn it down from a 10 to an 8. Then again I’m not the producer of an Idol group with a horde of adoring fans so what do I know really. What I do know is that it’s time for me to stop waffling on and actually start the review. So this single only actually has one song, which is a little disappointing. We didn’t even get solo vocal versions of said song. That song is “Kakushemu” by the way, which means to hide or cover up something apparently…maybe they’re talking about the vocals. I kid, I kid but they’re still pretty heavily vocoded so if that’s not your thing then that’s probably going to be a sticking point. To be fair though, there’s also some really catchy little hooks and the chorus specifically is very enjoyable to listen to. Can’t say I heard much of the new members though. On the instrumental side of things, it’s actually kind of interesting what they’ve gone for. They’ve tried to marry traditional Japanese music with modern EDM and it works, kinda. 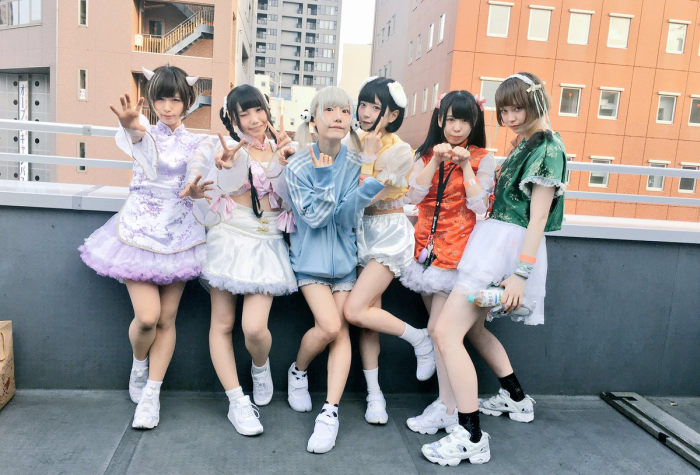 There are parts that kind of started sounding like Irish Folk music to me I won’t lie, but at least what they’ve done is different to all the other Idol groups who just slaps some shamisen into their songs and call it a day. For me personally, this is the most enjoyable CY8ER song I’ve heard so far. It does diverge quite a bit from what they’ve been doing up until now so maybe people who follow them more closely won’t be as into this one as me. I really like “Kakushemu” but like I mentioned earlier we didn’t really get to hear anything much out of the 3 newbies. It kind of feels like this song was written with 3-member CY8ER in mind. You can really see this in the music video by the way because there’s only really 3 people singing for the duration. I get it, but it is a little disappointing. Then again some would argue I wouldn’t even be able to tell the difference anyway. CY8ER are doing pretty well for themselves so far. Their crowdfunding venture was a huge success, they’re doing a nationwide tour with a big one-man live at the end of it, things are on the up and up. Maybe we’ll get an album or EP from them next, something with more than one song on it at least. Or maybe Rinahamu will lose interest in this project too and we’ll never get any of those things. She has previous after all. Just some bam with a keyboard whose opinions you shouldn't take at all seriously.